A Scottsdale woman who wanted to adopt an Arizona baby missing for more than a month has been released from a Phoenix jail. Police say 37-year-old Tammi Smith was not connected to the boy's disappearance and that she and her husband likely don't know where the boy is. Smith was interviewed at Tempe police headquarters Tuesday and later booked into Maricopa County jail on charges of custodial interference, conspiracy to commit custodial interference and forgery. Lt. Mike Horn said the charges stem from Smith's repeated and apparently desperate attempts to adopt 8-month-old Gabriel Johnson, not from the boy's Dec. 26 disappearance in San Antonio. As she was leaving jail, Smith told reporters the Tempe Police Department is trying to create a case. Smith said it doesn't mean those charges leveled against her "are going to stick. Doesn't mean those charges are true." It seems like LE have bigger fish to fry in this case??? Not sure why they are persuing this at least now?? Maybe they thought she knew something and wanted to scare her into telling what she knows?? Kh~I am praying extra hard too. I have a feeling the baby is alive and she sold him to someone. I hope so anyway. She could have killed him at any time in the last eight months, why wait till someone is willing to take him off of her hands for a small fee?? I hope that baby Gabriel is found soon, and alive. If his mother killed him to punish his father, then she deserves to pay with her life. The number of children murdered by a parent seems to be escalating. SAN ANTONIO - The father of a missing Arizona baby, last seen here in San Antonio, is in town to look for the little boy. Logan McQueary arrived at the San Antonio Airport Friday night. He plans to start searching for baby Gabriel Johnson first thing Saturday morning. News 4 WOAI asked McQueary if he believes that he will find evidence in San Antonio that will lead to Gabriel. "I think there is a big possibility," said McQueary. "I think everything is here. That's why we came to San Antonio. Everything leads to San Antonio and I think we can find all the answers here in San Antonio that will lead us to Gabriel." McQueary told News 4 WOAI that he is scheduled to meet with the San Antonio police chief and detectives. He feels they are not doing enough to look for his son. While McQueary said he's hopeful Gabriel is still alive, he believes the police should have already searched a San Antonio landfill for the boy's body. McQueary wants police to search that area so they can rule out a connection to the landfill and move on to other leads. 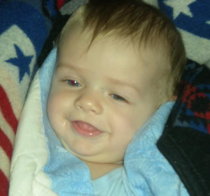 Baby Gabriel was last seen with his mother, Elizabeth Johnson, back in December at a hotel near I-10 and Huebner. She is in jail in Arizona and is charged with kidnapping, child abuse and custodial interference. Johnson told the boy's father she killed Gabriel, stuffed his body in a diaper bag and threw it in a dumpster. She later changed her story to say she gave the baby to a couple she met in a park. Police say Johnson is not cooperating with their investigation. While McQueary feels that San Antonio Police officers are not doing enough to look for the baby, San Antonio police say they are doing a lot of work on the case. They say the investigation is very active and detectives are following up on leads. A spokesman for the department said officers look forward to meeting with McQueary and talking to anyone who may have information about Gabriel. After his meeting with police, McQueary plans to retrace the steps that the baby's mother took in San Antonio. He plans to visit the hotel where she was last seen with the baby and the motel where her car was found on the South Side. If you have any information about this case, please call Crime Stoppers at 224-STOP.
" While McQueary said he's hopeful Gabriel is still alive, he believes the police should have already searched a San Antonio landfill for the boy's body. McQueary wants police to search that area so they can rule out a connection to the landfill and move on to other leads"
Here is another sad case of a missing child and one that likley met his fate at the hands of his own mother. Residential garbage that had been picked up, may have been but is this sufficient? Whyhave no reporters done this in Haleighs case??? Its easy to call the landfill...anyone can... Why arent they going the extra mile....???? SAN ANTONIO -- Sources have revealed to KENS 5 that when Elizabeth Johnson vacated her hotel room at the Homegate Inn & Suites in late December, she left behind all of her son's personal belongings. But there reportedly was one item investigators could not find: a green diaper bag that belonged to Gabriel Johnson. Of course, the 8-month-old was missing, too. A joint investigation involving authorities in San Antonio and Arizona led to a portion of the Tessman Road Landfill being roped off. Johnson allegedly sent the baby's father, Logan McQueary, a text message saying she had killed their child, placed him in a bag and put his body in a dumpster. Trash from her hotel would come to the area where San Antonio police are currently searching. That's where sources said police are looking for a green diaper bag or suitcase that could contain the child's body. San Antonio police have called the case both a missing person case and a capital murder investigation. Sources said the young mother's text to Gabriel's father declared she would direct him to their child's blue body if the garbage does not take him prior to that alert. Johnson allegedly came to San Antonio trying to elude child custody issues with McQueary. Sources said she wanted to adopt little Gabriel to a Tempe, Arizona, couple, Jack and Tammi Smith. KENS 5 has learned that police have evidence of communication between the Smiths and Johnson while she was in San Antonio. According to sources, they allegedly were discussing ways to conduct an illegal adoption. But police reportedly have not been able to conclude that such an adoption ever happened. Sources said police did find witnesses who saw Johnson shopping without Gabriel the day she abandoned her grandfather's vehicle at a south-side Motel 6. Investigators say that's when she used a fake last name to buy a bus ticket to Miami, Florida. Sources said the child did not make the trip. Johnson was arrested on child custody charges in Florida. Police have said the mother was uncooperative. She reportedly said Gabriel was given to a couple in a San Antonio park, but sources said subsequent questioning of the toddler's mother revealed inconsistencies in her story. The woman who attempted to adopt baby Gabriel Johnson before his disappearance has been indicted. According to a report from the Maricopa County Attorney's Office, a grand jury indicted Tammi Peters Smith on Wednesday for conspiracy to commit custodial interference and forgery. Smith is accused of withholding information from police and providing false information on paternity documents which inaccurately listed Smith's cousin as Gabriel's father, the report said. Officials also released information about the hotel room in Texas where Gabriel was last seen alive. Police said that when Gabriel's mother, Elizabeth Johnson, checked out of the hotel, she left all of the baby's personal items behind. The only missing item, police said, was the green diaper bag that Elizabeth Johnson claims to have put Gabriel's body in before throwing it in the trash. Gabriel's mother has already been indicted on charges of kidnapping, child abuse, custodial interference and conspiracy to commit custodial interference. A search through a San Antonio landfill for Gabriel's body is ongoing. It is beginning to read like a mystery thriller, a Lifetime movie, this search for Baby Gabriel Johnson, especially now that the father, who has set off on a cross-country retracing of the route that the mother took to San Antonio with his 8-month-old son, has become the victim of a suspicious burglary in the Texas city. Some believe that Logan McQueary may have stirred up some of the underground element that deals in human trafficking and/or illegal baby adoptions in the area by asking questions about his missing son. Because it does seem strange that the thief (or thieves) that broke into McQueary's vehicle took only one thing and left other items that might be considered valuable. The thief (or thieves) took a GPS system. Could the thief (or thieves) have thought they were protecting themselves by taking McQueary's GPS, not knowing that he was following the coordinates of a GPS (and that the GPS was not the original with Johnson's coordinates)? Could the thief (or thieves) have been trying to protect whoever has Baby Gabriel Johnson? The theft is suspicious in that bags of luggage and portable radios sitting in the truck's seats were left undisturbed. Logan McQueary and his family have been warned by police to refrain from interviews for awhile. Other than a vague description of the couple she supposedly gave her son to (or may have sold him to) in a park in San Antonio, Elizabeth Johnson refuses to cooperate in the finding of her missing baby. Investigators do not know whether to believe the San Antonio giveaway story or the story she gave Miami authorities when she was picked up on a custodial interference warrant on Dec. 29. She retracted what she had texted Logan McQueary on Dec. 27 that she had killed and disposed of Baby Gabriel Johnson's body. Johnson told Miami authorities that she had only texted McQueary such a horrible message for revenge, for his having ruined her life. In the meantime, authorities in Arizona and Texas have been conducting a dual investigation: missing person and homicide. But the story does read like a dramatic thriller: a young man searches for his missing son, while the forces arrayed against him conspire to keep his son from him. No doubt the story will one day be made into an actual movie. And the missing GPS might be an important part of the story -- or it might be a simple petty theft. Unfortunately for Logan McQueary, his family, and the authorities involved in the investigation, the plot is all too real, the storyline one of actual events unfolding. While San Antonio police continued looking for a missing Arizona baby at an East Side landfill, officials said Tuesday the second phase of the search could begin later this week. Along with the police, the FBI and the U.S. Marshal's Service will aid in the search for 9-month-old Gabriel Johnson, who last was seen Dec. 26 in San Antonio with his mother, Elizabeth Johnson, said police department spokesman Matthew Porter. During the second phase, authorities will begin “sifting through layers of garbage in search of possible evidence,” according to a department media advisory released last week. Since several organizations and companies have donated personnel, equipment, funding and services, Porter said there wouldn't be any cost billed to taxpayers for either phase. The baby's father, Logan McQueary, returned to Arizona after spending about a week in San Antonio searching for clues in his son's disappearance, said Jay J. Armes, the El Paso private investigator who took on the case earlier this month. McQueary could not be reached late Tuesday, but Armes said he has been speaking with the father daily. Armes said McQueary was “very optimistic” about his search in San Antonio and that he and McQueary are planning to return soon. He also said he's been getting up to 70 “good leads” each day, some that have led the investigation into Mexico. “We have a good feeling the boy's still alive,” Armes said. PHOENIX -- The Scottsdale woman who wanted to adopt Baby Gabriel, the Tempe baby who has missing since just after Christmas, is due in court today. Tammi Smith, who was indicted earlier this month, will hear charges of forgery, custodial interference and conspiracy to commit custodial interference. In the meantime, the search for Gabriel Johnson moves into its next phase. SAN ANTONIO -- San Antonio police say crews searching a local landfill for clues to the fate of a missing Arizona baby have reached the target level of their dig. A Wednesday statement from San Antonio Police Chief William McManus says crews had only to reach a 30-foot depth of an expected 45-foot depth in the Tess man Road Landfill. McManus says a meticulous second phase of the landfill search will begin Thursday. However, he says the hope remains that the 8-month-old will be found alive. Searchers are looking for a specific item -- a diaper bag. Baby Gabriel was last seen with his mother, Elizabeth Johnson, shortly after Christmas at a San Antonio hotel. The diaper bag was the only thing missing from the room when police searched it. Johnson was later arrested alone in Florida and then extradited to Arizona. She remains behind bars on charges of kidnapping, child abuse and custodial interference. She told the boy's father she killed Gabriel and dumped him in the trash -- a story she later recanted. Earlier this month, San Antonio reclassified the Baby Case as a homicide investigation. That procedural step is what allowed them to launch the search of the landfill. Elizabeth Johnson, the mother of missing baby Gabriel, refused to leave her jail cell for a court hearing Tuesday morning, prompting a Superior Court judge to demand authorities "use any means necessary to get her to court." Maricopa County Superior Court Judge Timothy Ryan continued the pre-trial conference hearing to March 17, saying that Elizabeth Johnson needed to be present and called on Maricopa County Sheriff's Office deputies to ensure Johnson makes the appearance, said Karen Arra, a court spokeswoman. Johnson's defense attorney refused to comment on the case. Johnson, the Tempe mother of missing Gabriel Johnson, is at the center of the high-profile missing baby case. She left the state amid a custody battle with the boy's father last December and was last seen with the child in San Antonio. 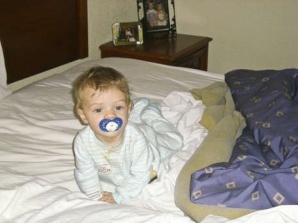 Gabriel was 8 months old when he disappeared. Originally, Johnson told Gabriel's father that she had killed the baby and disposed of the body in the trash but later recanted, saying she gave the baby to an unidentified couple in a San Antonio park. Didn't KC pull the same stunt and the judge ordered the guards to go back and get her? I'm afraid I think this woman murdered her baby out of spite, just as she said. But I'm also hoping he's alive and well somewhere. If she's not worse than Casey, she's close to it. Her text to Gabriel's father is pure evil. Even if she sold Gabriel instead of killing him, that doesn't make her any better. Here is her text in case you missed it. You will never see Gabriel again. I made sure of that. And you can spend the rest of of your pathetic life wondering about him. You will never find me. I'm already boarding a plane out of the country. When I'm safe, I'll email you the exact location of dead Gabriel's little blue body, if the garbage don't come first. This is what liars like you deserve. Yes, those are chilling words to read...pure evil. I'd say she's right up there with KC. I'd go as far to say KC had similar words directed towards Cindy going on in her head as she wrapped the duct tape around Caylee's face and head. Nearly three months after he went missing, San Antonio police called off the landfill search for the remains of baby Gabriel Johnson after finding no evidence of foul play, Police Chief William McManus said Friday afternoon. Law enforcement authorities, with the help of countless volunteers, searched through 4,260 tons of trash and debris over 16 days at the Tessman Road Landfill. But since the excavation began Feb. 9 authorities “found no evidence of a homicide,” or anything related to 8-month-old Baby Gabriel, the chief said. At this point, McManus said it is unclear if Gabriel is alive or dead — mainly because the baby's mother, Elizabeth Johnson, refuses to cooperate with authorities. The landfill area was targeted because authorities believed debris at the dump site may have come from a trash bin at the HomeGate Studios and Suites on San Pedro Avenue where Johnson had stayed. Gabriel was last seen with Johnson at the hotel Dec. 26, after the young mother arrived here from Arizona. Gabriel's father, Logan McQueary, has said Johnson texted him the following day that she had killed her baby and later told him she put the baby in a diaper bag and threw it in the trash. Johnson then went to Florida, where she was arrested Dec. 30 on kidnapping, child abuse and custodial interference charges. She has since been extradited back to Arizona, where she remains in custody. Authorities have contacted McQueary to notify him of the search's end. At the news conference, McManus also thanked the countless volunteer and community partners who helped with the search. Although police spokeswoman Sandy Gutierrez said the help meant the search was done at “virtually no cost to the taxpayers,” she didn't provide how much the city spent on the effort. The case, which will remain active, is now being handled by the SAPD Missing Persons Unit, McManus said. The homicide unit will continue to investigate any information that indicates foul play in the case. McManus said department officials plan to meet to plot their next steps in the investigation. “But we will pursue this with the same vigor that we started the investigation,” McManus said. Anyone with information about the case should call (800) THE-LOST (843-5678). PHOENIX (AP) — The father of a missing Arizona baby says he plans to move to San Antonio, Texas, later this month to continue the search for his son. Logan McQueary made the announcement Saturday night during a fundraiser. It was the first time he'd spoken publicly since police in San Antonio called off a landfill search after finding no evidence in Gabriel's disappearance. McQueary says he already has a job and an apartment in San Antonio. He's spent the last several months hunting for Gabriel. He believes the baby is alive and may have been illicitly adopted. Gabriel was last seen with his 23-year-old mother, Elizabeth Johnson, in San Antonio on Dec. 26. The Arizona woman is jailed on kidnapping, child abuse and custodial interference charges. I am glad he's taking more of an initiative to find baby Gabriel - I have to say that at first I really thought he didn't care. I wish him the best and hope that he can aid in some capacity. PHOENIX -- The mother of a missing Valley boy appeared in Maricopa County Superior Court Friday, but refused to talk about the child or his whereabouts. Elizabeth Johnson, 23, invoked her Fifth Amendment rights against self incrimination when Craig Mehrens, an attorney for her missing son's father, started asking questions. Judge Michael McVey granted sole custody of the boy, Gabriel Johnson, to his father, Logan McQueary. Gabriel, who will turn 1 on May 3, vanished in December after his mother allegedly took him from the Valley during a custody fight with McQueary. The mother and son were last seen together Dec. 26 at a motel in San Antonio, Texas. Elizabeth Johnson was arrested in Florida a few days later and returned to Arizona to face charges. She has told conflicting stories of what happened to Gabriel -- at one time saying she had killed him and at other times saying she had given him away. Friday's court appearance came two weeks after Elizabeth Johnson refused to leave her jail cell and appear in court. She has been indicted on charges of kidnapping, child abuse and custodial interference. McVey set an April 28 hearing on Mehrens' request that Johnson be held in contempt for violating an earlier ruling that gave McQueary visitation rights with Gabriel. PHOENIX (AP) — A judge awarded custody of a still-missing Arizona baby to the boy's father on Friday. Logan McQueary will take custody of Gabriel Johnson if the baby is ever found. The child's mother, Elizabeth Johnson, has refused to answer any questions from a Maricopa County Superior Court judge or McQueary's attorney about where Gabriel is. The baby will turn 1 on May 3, but Johnson has refused to say if the child is alive or where he is. While engaged in a custody battle with McQueary, Johnson disappeared with the child. The two were last seen together in December in San Antonio. Earlier this month, authorities gave up their search for a body in a San Antonio landfill. The 23-year-old Johnson has been indicted on charges of kidnapping, child abuse, conspiracy to commit custodial interference and custodial interference. Maybe they should charge her with murder, even without a body. If she did give/sell him to someone else, they may bring him forward. Even if no one does bring him in, she should still be charged with murder, as she probably DID kill him. sitemama wrote: Maybe they should charge her with murder, even without a body. If she did give/sell him to someone else, they may bring him forward. Even if no one does bring him in, she should still be charged with murder, as she probably DID kill him. I am with you 100%, sitemama! Speak them rather now instead." Ken Gamble believes Gabriel's mother, Elizabeth Johnson, did not hurt her baby, but rather brought him to a San Antonio, Texas park as she was told to do. New information is coming out in the search for a baby missing since December: the family's private investigator breaks his silence. Ken Gamble is the private investigator hired by Gabriel Johnson's father, Logan McQueary. Gamble believes Gabriel's mother, Elizabeth Johnson, did not hurt her baby, but rather brought him to a San Antonio, Texas park as she was told to do. "We have been able to confirm through the investigation so far that this is the park where Elizabeth handed the baby to a couple." said Gamble. "That information is supported by her own handwritten notes in her journal. She wrote down directions to the park...she arrived..the couple was already sitting in the park so we now know they were sitting at one of those tables..they immediately got up and they greeted her. They said something to her which we are not revealing at this point to identify themselves." Gamble is asking anyone in San Antonio who saw the meeting to come forward. He says he's confident the mystery couple will be found. I certainly hope this is the case and she didn't kill that precious baby. PHOENIX - 23-year-old Elizabeth Johnson, the woman imprisoned for kidnapping her son Gabriel and refusing to tell police where he is, has gone on a hunger strike and written a will to prepare for her death. Following the submission of her will, Johnson was placed in the jail's psychiatric unit for evaluation. About two weeks ago, jailers placed Johnson on the Sheriff's nutra-loaf system after she allegedly attacked two other inmates. The loaf consists of nonfat dry milk powder, an assortment of fruits and vegetables, chili powder, and bread dough all compacted into one solid brick-like loaf. The nutra-loaf system aims to deter inmates from misbehaving or assaulting others. They are served the nutra-loaf in isolation, instead of a sack lunch in the morning and a hot meal in the evening. The diet, sometimes called "bread and water," has raised controversy like many of the Sheriff's initiatives. Just last week, claims that the nutra-loaf was unconstitutional punishment were dismissed. Johnson is apparently refusing to eat the nutra-loaf, saying it's "rotten food with worms in it," and has gone on a hunger strike. Read her will below, transcribed from her own handwriting. Gabriel Johnson was 8 months old when he went missing in December. Johnson told her ex-boyfriend Logan McQueary she killed Gabriel and left his body in a dumpster, but told police she gave the child to an unknown couple at a San Antonio park. A search of a San Antonio landfill proved fruitless. I am writing my advanced directive and will because I am incarcerated in Estrella jail and they are starving me and serving rotten food with worms in it. I haven't eaten in over 7 days and barely can write this. The water… makes us sick. I feel they will let me starve to death rather than feeding me safe, edible food. I don't want an autopsy, I do not wish to donate any organs/body parts. That is against my religion. I wish my grandmother be contacted [phone number] only. I wish to be cremated right away, put in a box not an urn and brought to mass to be buried above my mother's grave. I know my grandmother Sylvia [last name] will arrange this for me. White lilies for me is all. I don't think I'll have time to have my lawyer notarize this because I am starving and so weak and dehydrated so I will put a tank order in for a notary. I love you Marzzy. I am sorry be happy for us. Stubborn remorseless biotch...they should put her in with Casey. They are two of a kind. May she soon be with the worms. I guess she doesn't like fruit cake!!!! 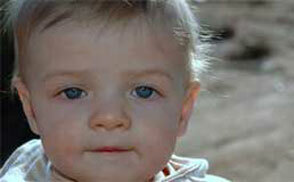 PHOENIX - Baby Gabriel Johnson is 1 year old, but the search for him continues. May 3 is his first birthday, and more than four months following the child's disappearance, his mother Elizabeth Johnson, is still behind bars and investigators are trying to determine whether Gabriel is alive or dead. A friend of the boy's mother, says he believes Gabriel is still alive. 23-year-old Sorin Stanescu says stands by Elizabeth and says he's one of the only friends she has left. "Her parents passed away, friends are against her. I think we are the only good friends..she has me and my sister.." said Stanescu. Johnson is accused of kidnapping her son and leaving Phoenix. Stanescu met Johnson a few years ago. Two nights before the baby disappeared, Elizabeth stayed at his apartment with Gabriel. He offered to take care of them. "I have a second room. I said I will support the baby..I will buy everything..don't worry about the money. I told her I was going to do all of that for her." Stanescu said. On the morning of December 18, Stanescu woke up and found that Johnson was gone. He received a couple of phone calls from her while she was on the move. One from Texas and another from Florida. He didn't see her again until she was behind bars at the Estrella jail in Phoenix. Stanescu says he strongly believes Johnson would never have hurt her child. "I said is the baby alive and she said yes, she said yes." said Stanescu. He also says Johnson lied to the police in the beginning, to protect the people that helped her to have the unknown couple take care of Gabriel. She has since given all the information she knows to police. "She only tell me she gave the baby to these people..and she didn't ask for information. She didn't do it because she trusted them with her heart." Stanescu said. When asked if he thought if Elizabeth is a killer, Stanescu said, "No she's not. She's a very nice person." Elizabeth Johnson remains behind bars. Updated: 5:57 pm, Thu Jun 3, 2010. The mother of missing Baby Gabriel is not competent to stand trial now but can be rehabilitated and possibly stand trial at a later date, a Maricopa County Superior Court commissioner ruled on Thursday. Commissioner Steven Holding handed down the ruling based on determinations made by two court-appointed doctors who conducted a psychological evaluation of Gabriel Johnson's mother, Elizabeth Johnson, who remains incarcerated in a Maricopa County jail on $1.1 million cash bond in connection to the disappearance of her son. The ruling excuses Johnson, 23, from participating in further court proceedings regarding the disappearance of Gabriel, who has been missing since December. Originally, Johnson said she killed the baby, according to police and court documents; later, she said she gave Gabriel to a couple in San Antonio. Attorney Nicholas Alcock, who is representing Johnson in the criminal portion of the case in which Johnson is charged with kidnapping, child abuse, custodial interference and conspiracy to commit custodial interference, told the Tribune he received the results from Johnson's psychological evaluation on Wednesday and is reviewing the report. Johnson and the boy's father, Logan McQueary, also are proceeding through a custody hearing in Maricopa County Superior Family Court in which Judge Michael McVey placed a hold on whether Johnson will be found in contempt of court for refusing to say what she did with Gabriel and reveal where he is, pending the outcome of her psychological evaluation. "Both (court-appointed) doctors believe she is not competent to stand trial," Alcock said. "They have determined that Elizabeth cannot control her thought process and that she is not able to think in a linear fashion, meaning that she is not able to think logically or make decisions." Johnson left Arizona for San Antonio with her son in mid-December, and on Dec. 27, told McQueary, her estranged boyfriend and father of Gabriel, that she killed the boy, stuffed his body in a diaper bag and then threw it into a dumpster, according to court documents. When Johnson was arrested in Miami Beach, Fla. on Dec. 30, she told an FBI agent that she gave Gabriel to a couple at a motel she was staying at a day after meeting them at a park in San Antonio, according to court records. The case of Baby Gabriel has received national media attention and has been the subject of numerous national television news programs in the months following Johnson's arrest. If alive, Gabriel would now be 1 year old. Alcock, who requested the a psychological evaluation or Rule 11 hearing to be held for Johnson, said he "had some deep concerns" that Johnson could not think clearly and believed she would not be able to think logically or assist an attorney in preparing a defense. Alcock also noted that doctors at the jail had placed Johnson on psychiatric medication after a recent incident in which she assaulted two inmates, resulting in solitary confinement. Johnson has since been returned to the general jail population. "The court won't allow anyone who is incompetent to stand trial," Alcock said. Alcock said he expects that Johnson likely will be placed in a "restoration process," in which she would receive therapy and medication. "It is very rare for someone to be determined incompetent, but not be restorable or rehabilitated through therapy and medication," Alcock said. A restoration hearing regarding the status of Johnson's mental condition will be held in Maricopa County Superior Court on Aug. 12. "Everything is very doctor driven," Alcock said after Thursday's ruling. "It will be up to the doctors to determine her mental state and how she's doing. The defense and prosecution both are in agreement that there are competency issues." I'm glad that it is still possible that she can still stand trial at a later date once she is rehabilitated and deemed competent by the court. Gabriel Scott Johnson has been missing for six months, and his whereabouts and well-being remain a mystery. His mother, Elizabeth Johnson, remains incarcerated in a Maricopa County jail on a $1.1 million cash bond on charges in connection to his disappearance and currently is incompetent to stand trial. In the midst of a custody battle, Johnson, 23, of Tempe, told Logan McQueary, her estranged boyfriend and the child's father, on Dec. 27 that said she killed the then 7-month-old baby, stuffed his body in a diaper bag and threw it into a dumpster in San Antonio, according to Maricopa County Superior Court documents. She later told authorities that she gave Gabriel to a couple she had never met in the parking lot of motel in San Antonio a day after meeting them in a park, sparking national media attention and a search that included the FBI, two renowned private investigators and McQueary himself. For reasons unknown, San Antonio was the first destination entered into a GPS device Johnson had that was confiscated by police. The boy was last seen at a HomeGate Studios and Suites in San Antonio on Dec. 26, purportedly a meeting place for underground adoptions, according to authorities. Johnson, who was arrested in Miami Beach, Fla. on Dec. 30 without the child, is charged with kidnapping, child abuse, custodial interference and conspiracy to commit custodial interference. Sandy Gutierrez, a spokeswoman for the San Antonio Police Department, told the Tribune on Thursday that there have been no developments in the case since March 12. That was the day investigators ended a 16-day excavation of a landfill in San Antonio after sifting through 4,260 tons of trash in an attempt to find any of the boy's remains or evidence that would help the case. Police also would not say whether they were able to locate a young Hispanic man, a known drug dealer, seen with Johnson at a motel in San Antonio where she was staying, according to authorities. Nor did they release the man's name. Gutierrez also said that the police department has received very few tips in the last three months. "As unfortunate as it may be, nothing new has developed," Gutierrez said. But by nearly all accounts, the search for the missing child remains ongoing and active and still is being investigated as both a homicide and a missing persons case. The family of McQueary said they remain in contact with authorities at least once a week, but could not release details of the investigation. A statement issued to the Tribune from the McQueary family said, "We are unable to comment any further regarding the ongoing investigation into the disappearance of Gabriel, except to confirm that law enforcement continues to investigate all leads." Two Internet Facebook pages for Gabriel, Find Baby Gabriel and Pray for Baby Gabriel, each have more than 1,400 members. Gabriel Johnson, who has light brown hair and blue eyes, now would be 1-year-old. Tammi Smith, 38, of Scottsdale, the woman who had expressed interest in adopting Gabriel and provided false and misleading statements to Tempe police during their investigation, has been charged with forgery and conspiracy to commit custodial interference in connection with the case. Smith is waiting to resume court proceedings after Johnson's competency level is restored through medical treatment and counseling, which she now is undergoing. McQueary, 25, of Gilbert, had spent a short time living in San Antonio searching for clues that had been overlooked in his son's disappearance, but has since returned to Valley where he has obtained a job, according to his aunt, Kelli McQueary. He could not be reached for comment. Jay J. Armes, a private investigator based in El Paso, Texas, and his associates initially had assisted McQueary in the search. Later on, Australia-based private investigator Ken Gamble also participated in the search, but he resigned from the case on June 5 due to lack of funding, according to Kelli McQueary and Gamble. Both Armes and Gamble strongly believed through evidence and information they reviewed from the case that Gabriel still is alive. This whole case still astounds me. I believe it is this thursday that is the deadline for her to have been rehabilitated and found competent. If she is not found to be the charges will be dropped and she will be commited to a state hospital. How could the father have not known how mentally unstable she was or the grandfather she and the baby lived with.How did he just disappear without a trace and this sicko get away with it? I just don't understand with all of today's technolgy etc how she could have pulled this off! The father or grandfather might have known that she was mentally unstable. I know from personal experience that knowing a person is mentally unstable is often not enough to get the child away from the mother or even to get CPS to take the situation seriously until it is too late. Elizabeth Johnson, the incarcerated mother of missing baby Gabriel Johnson, was deemed competent to stand trial and her mental restoration process complete, according to information from the court, but a Maricopa County Superior Court commissioner on Thursday granted her attorneys an evidentiary hearing to contest the findings in the report. The report, conducted by two court-appointed doctors, was released to Johnson’s defense attorneys Thursday morning, just hours before the hearing, and specific details in it will not be discussed until a hearing on Sept. 23. It’s been more than a week since two court-appointed doctors released their findings in a report that determined the mother of missing Baby Gabriel Johnson is competent to stand trial, but her attorneys still do not want to comment on why they contend she is not. However, the missing baby’s mother, Elizabeth Johnson, knows what she’s doing and needs to start accepting responsibilities for her actions, according to her grandfather, Robert Johnson of Scottsdale. Elizabeth Johnson, 24, of Tempe is being held in Maricopa County’s Estrella jail on a $1.1 million cash bond on charges of kidnapping, child abuse, custodial interference and conspiracy to commit custodial interference in connection with the disappearance of her son, who was 5 months old at the time he was last seen on Dec. 26, and now is 1 year and 3 months old. How frustrating it must be for the authorities that they can't BEAT out of Elizabeth what she did with Gabriel! Sadly, it seems to be a recent trend, doesn't it? I think everyone is taking lessons from KC. Estee, I too think he is out there. I think she gave him to someone, and doesn't even know them. I tend to agree that there is a possibility little Gabriel is still alive, but it does make one wonder why whomever has him hasn't gone to the authorities. Unless they are trying to protect themselves from a crime. An honest, innocent person would surely have come forward by now. "However, the missing baby’s mother, Elizabeth Johnson, knows what she’s doing and needs to start accepting responsibilities for her actions, according to her grandfather, Robert Johnson of Scottsdale." As the Baby Gabriel case enters its ninth month, one constant has remained: His mother, Elizabeth Johnson, still refuses to say where he is. Her stubbornness is so steadfast that even her grandfather, Bob Johnson, is beginning to have his doubts. 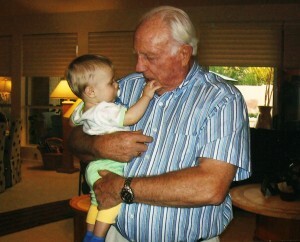 "The sooner they find that baby, the sooner she gets out (of jail)," Johnson, 80, of Scottsdale, said Wednesday. "She has not been cooperating with them in Gabriel, which is scary." The disappearance of the chubby-cheeked, towheaded Gabriel captured the nation's attention when it was first reported in December. Since then, Elizabeth Johnson, 24, of Tempe, has been arrested and is being held without bond in the Estrella Jail; a Scottsdale woman has been charged with conspiracy to commit custodial interference; and Logan McQueary, the boy's father, has been awarded full custody of Gabriel, who would now be 15 months old. McQueary has moved out of his Tempe home and has not spoken publicly for months about his son's disappearance. Despite this, McQueary told his child-custody attorney over a month ago that he still has hope his son is alive. "Last I talked to him, he absolutely believed it," Phoenix attorney Craig Mehrens said. The case of missing Baby Gabriel has become an Internet wildfire with thousands of people across the country devouring every electronic detail and pages on the sensational topic springing up across social media sites. "Bring Home Gabriel Johnson," "Gabriel Scott Johnson Missing - Psychic Discussion" and "The other side of the story, Elizabeth Johnson jail house communications" are but three of at least 20 Facebook pages dedicated to the case of the missing Tempe baby. Some users spend hours a day following the case via the Internet. In a digital-age media phenomenon, the case of Gabriel Johnson, last seen in San Antonio on Dec. 26, has become an Internet cause celebre. Rapt followers are taking sides in a free-for-all debate about the baby, the mother and the woman who wanted to adopt him. "Like never before, a huge swath of the American public is online and connected one way or the other," said Aretha Hill, director off the New Media Innovation Lab at Arizona State University's Walter Cronkite School of Journalism and Mass Communication. Tammi Smith, the wife of the couple who has been involved in the Gabriel saga since the beginning, on Monday said her attorneys are looking at a possible plea bargain on her forgery charge. Police said Smith used a phony name on paternity documents when Gabriel Johnson's mom, Elizabeth Johnson, was trying to keep the baby from his father, Logan McQueary.